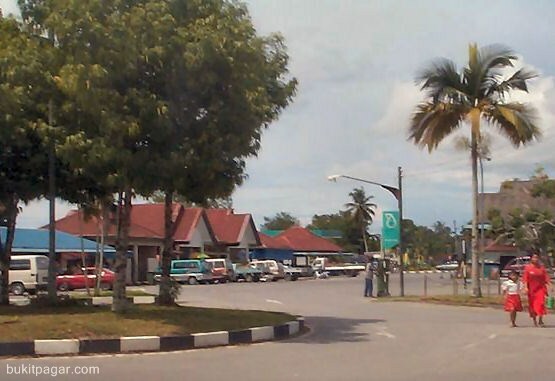 The road from Kuching is straightened and sealed. What used to be a four-hour trip of the bone-shaking kind is accomplished in one smooth hour. Some visitors come to Lundu District for S, S and S: Sand, Sun and Sea. Even in the old days of poor roads, the wide, clean sands of Sematan beach, half an hour's drive from Lundu, were a popular holiday resort. Today the hobby fishermen are heading for Sematan, eager to catch the barramundi introduced here by the Agriculture Department. The attraction is the sea itself, for swimming, diving and playing. There's fresh seafood when the boats come in, crabs crawl on the rocks, and there's a lively ikan pusu industry at the right season. When schools of the tiny anchovies swarm, the whole village is out there in the chest-deep water, hanging on to one long, fine net. Willing tourists are press-ganged into the operation, particularly the taller fellows! Other visitors go to the Gunung Gading National Park (1983).Today it is easily accessible; there are chalets for overnight accommodation. 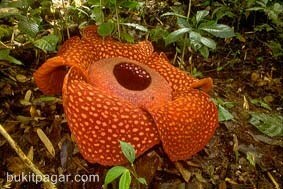 Gunung Gading's claim to fame, besides the waterfall and a very diverse bird population, is the Rafflesia. This malodorous wonder is the world's biggest bloom, reaching diameters of up to one metre. Rafflesia buds resembling purple cabbages lie in the dank jungle for months, until the time is right for the bright orange petals to unfold, revealing a variously dotted centre with bright tufts and emitting a very distinct ... scent. Numerous chalets and small 'resorts' have sprung up, especially in Siar, Pandan and Sematan. Drive there and ask around. Near Sematan beach: Palm Beach, Tel: 013-809 6986, ssd@asia.com. Twin room RM180/night, breakfast and dinner included; chalet RM330/night, breakfast and dinner dinner included. Family package (6 pax) RM390/night, breakfast and dinner included.